Do you know that you have many angels helping you everyday? Would you like to meet yours? We are all blessed with Spiritual Helpers, Spiritual Gifts, and Spiritual Healing. Angels To Guide You is here to help you understand the angelic influences around you and recognize the angels in your life. We are constantly updating the site with new information and teachings. 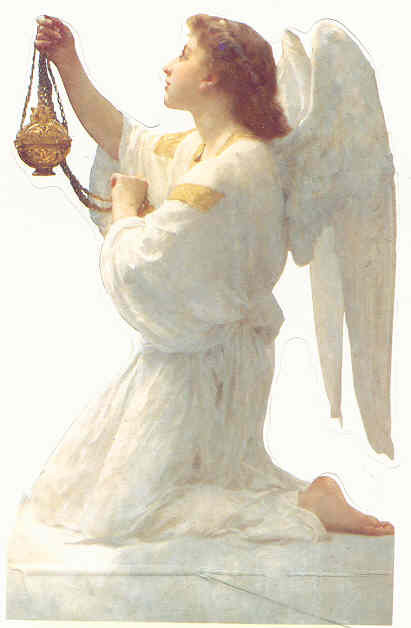 We invite you to freely share your personal angel experiences with us. Let spirit reveal your own personal blessing remind you that you are loved. Enjoy a beautiful work of art, and heavenly inspired Blessing to display in your home or office. Donna will meditate to create your inspired Watercolor or Pastel Blessing art. Each blessing is unique and spirit determines the colors, size, texture and channeled blessing. Your art will be created personally just for you. People have been asking about our Spiritual Development Classes. Because of everybody's busy schedule, we find it hard to set a day & time that can accommodate everyone. So we are making available, on mp3, our latest teleseminar Spiritual Development Classes, #1 & #2. SDC#1 is 6 lesson covering: Higher Self, Natural Law, Subtle Bodies, Spiritual Planes, Symbols, Meditation. Over 9 hours of information. A must for those traveling the spiritual path. SDC#2 is and advanced course with 6 lessons covering: Spiritual Gifts, Healing, Manifesting, Communication, Spiritual Warfare, Meditation. Over 10 hours of information. To order: go to our catalog (click) , add it to your cart, then go to checkout. * Because of their length, these CD's are on mp3 format. Discover a new understanding of angels and the purpose of the angelic realm. Our indepth angel teleseminar course is now available on mp3. Listen and learn at your leisure. The course includes detailed history of angels and ancient teachings, Explore the Choirs of Angels and the energy each choir offers humanity. Learn the mission of angels, how angels interact with humans, the legends of fallen angels that affect human evolution, angelic encounters, angel meditations and practical, safe techniques to contact your angels. Rev. Donna Voll is serving God and helping thousands of people with her ministry, spiritual counseling, and her unique spiritual Angelic Portraits. These portraits reveal the angels that work with you and include faces of family, friends, and guides that are spiritually influential to you. Very often, many of these faces are recognizable as loved ones who have passed over. Rev. Voll's remarkable spiritual gift serves as proof that there is a spiritual life after death, and that we are not alone. She is the author of a popular children's book, Tell Me... could a bad thing happen to me?, the first in a series of spiritual children's books. Rev. Voll travels internationally sharing her gifts through radio and television interviews, teaching workshops and seminars, serving churches, and private consultations. One Question via e-mail response is now possible. Donna will meditate connecting to your Higher Self and email Spirit's insight regarding one question. A new way to meet your Angels. Experience the beautiful pastel image of the special angel in your life. A heavenly gift for everyone! Listen to Donna & Dudley discuss how to find your Divine Partner on their radio program, "Spirit Connections". Looking for an Angelic Experience? click here! "Spirit Connections" Radio Program. click here! The Animal Rescue Site - Feed an animal - for Free! click here! Study at your own pace with this mp3 of our six week teleseminar class.